Rasa Malaysia is proud to announce that the well-known Malaysian TV personality, Chef Kamarul will be overseeing our new cooking classes and demonstration, including delicious food tastings. Chef Kamarul’s outstanding credentials in the culinary industry includes hosting over 20 different TV cooking shows with some of the highest viewed in Malaysia, topping over 1.5 million viewers. 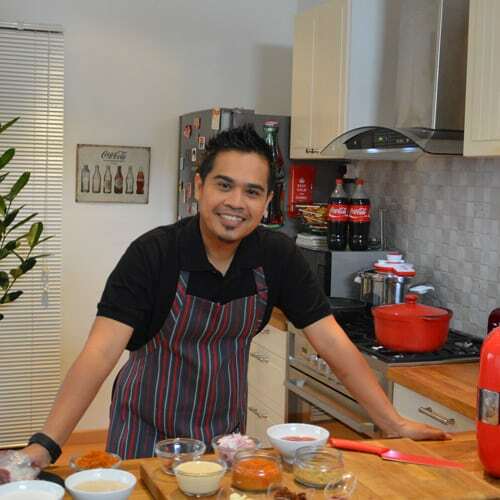 He has authored three Malaysian cookbooks winning the Gourmand International Cookbook Award (Madrid, Spain) for Best Malaysian Celebrity Chef – Cookbooks and Best Malaysian Easy-Recipe Cookbooks. His culinary expertise is currently in high demand all over Asia and Australia. Chef Kamarul is a Lecturer on the Faculty of Hotel & Tourism Management, Universiti Teknologi MARA. He is also a Ph.D. Candidate for Doctor of Philosophy from Griffith Business School, Griffith University, Gold Coast, Queensland, Australia. This exclusive engagement and highly anticipated cooking demonstrations and classes will be performed live in front of RASA Malaysia Café at the Eastern Market Kitchen. Actual event dates will be released soon. Stop by the café, visit our website, and join us on Twitter or Facebook for the official announcement of this event. Don’t miss this opportunity to see, taste and book your class as seats are limited.